The 35th annual India International Jewellery Show (IIJS), held at the Bombay Exhibition Centre in Mumbai Aug. 9–13, ended on a high note as exhibitors celebrated an increase in visitors and a corresponding spike in sales, all of which bodes well for the upcoming Indian festive season. According to a survey by Diamond World magazine, the growth in visitors—from 35,000 in 2017 to 40,000 this year—contributed to a 30 percent jump in sales, particularly in the studded and gold jewelry categories. From collections designed for daily wear to elaborate bridal jewels, gold jewelry ruled the fair, as usual. Among the more casual designs, long chains with beads and tassels and pieces featuring gems such as morganite, coral, and turquoise were in high demand. 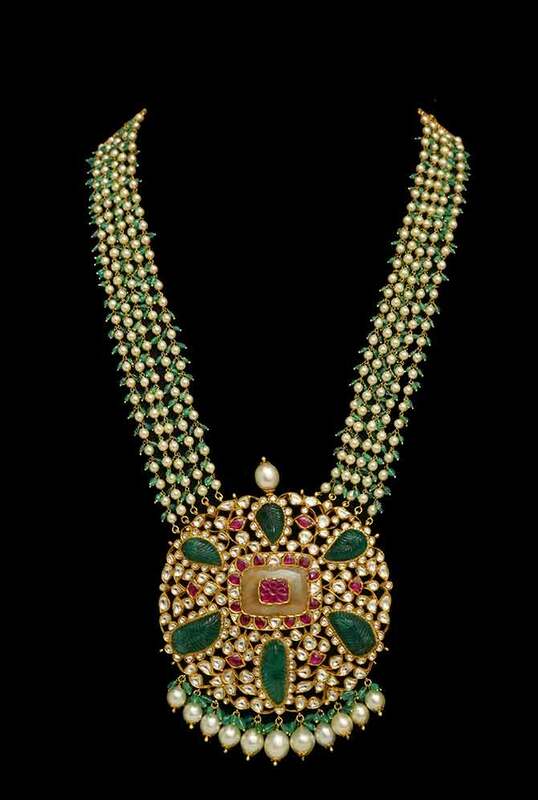 Traditional kundan polki jewelry and fusion jewelry featuring a mix of gold, polished diamonds, uncut diamonds, and gemstones were among the strongest trends visible at the exhibition. 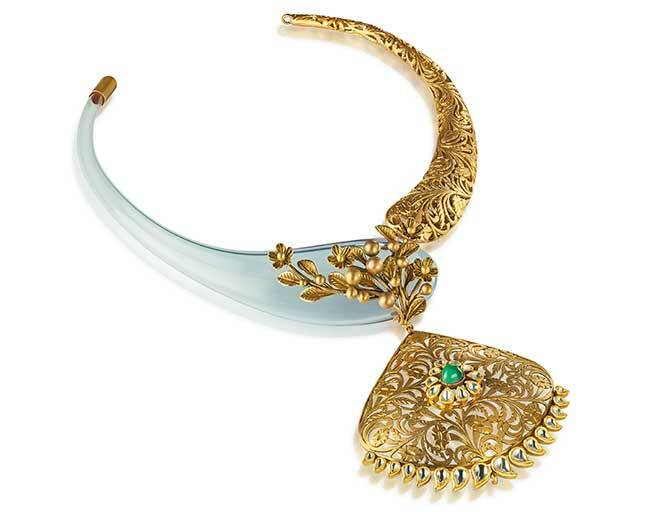 Designer Anand Shah, a master of gold jewelry, presented a few unique ideas at the fair. Following the success of his Aaina (Looking Mirror) collection last year, he introduced a line of Italian blown-glass jewels that received a phenomenal response from retailers. 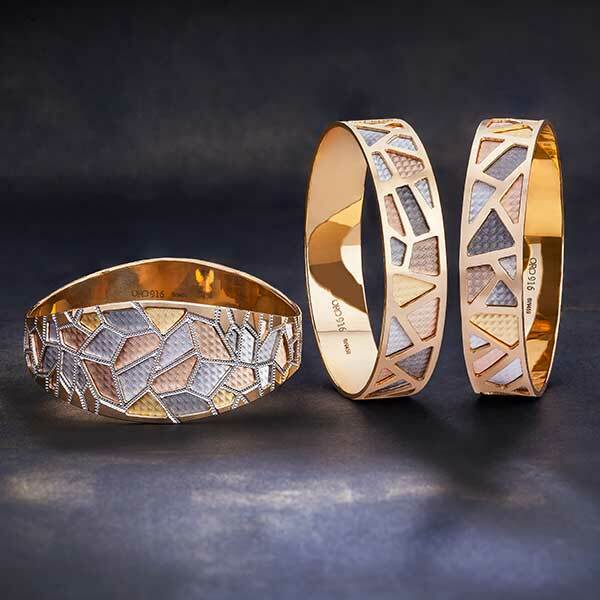 Likewise, Oro, a manufacturer that exports to Indian retailers based in the U.S. and Europe, introduced a new Mosaic collection of bangles as well as a line of bracelets featuring changeable leather details, both of which garnered attention from buyers. Overall, the fair featured a slew of new attractions that were well received by exhibitors, such as a 116,000-square-foot exhibition area, Hall 7A. “All the top diamond manufacturers and gold manufacturers are in Hall 7, making it a plump club, with extravagantly constructed booths and a more spacious look,” says Priyanshu Shah, executive director of A’Star Jewellery. 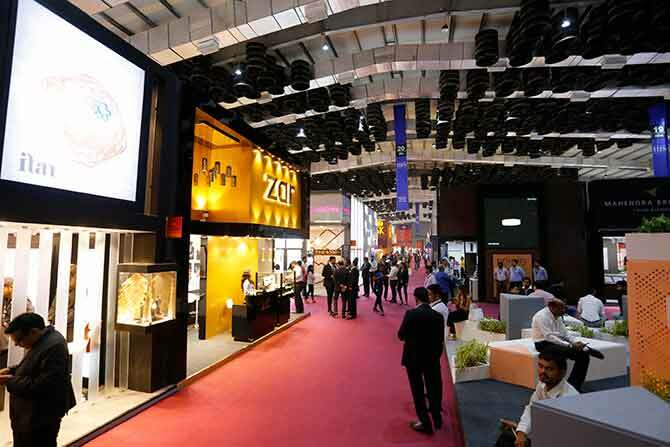 The 2018 edition of the India International Jewellery Show featured a new 116,000-square-foot exhibition area, Hall 7A. Pramod Agrawal, chairman of the Gem and Jewellery Export Promotion Council (GJEPC), the fair’s organizer, said exhibitors and visitors were pleased with the changes. “We not only had a new hall and about 800 new booths, but we also had visitors from all over the country and many from abroad, including official delegations from 15 countries,” he said at a press conference.